Tag line: "CAT or WOMAN or a Thing Too Evil to Mention?" Between 1960 and 1964, Roger Corman directed a number of films inspired by the writings of Edgar Allan Poe, including The House of Usher, The Pit and the Pendulum, The Raven and The Masque of the Red Death, all of which starred the incomparable Vincent Price. For his final entry in the series, Corman chose to adapt Poe’s short story The Tomb of Ligeia, and in so doing created what is arguably the most frightening of the bunch. 19th Century British nobleman Verden Fell (Price) has just laid his beloved wife Ligeia (Elizabeth Shepherd) to rest, burying her in a consecrated plot on the grounds of his crumbling abbey. Yet, in spite of her recent demise, Fell is convinced the lady Ligeia is still alive, and will likely live forever. A short time later, he meets Lady Rowena Trevanian (also played by Shepherd), who, aside from her physical resemblance to Ligeia, has a personality very similar to that of his late wife. Fell and Rowena eventually marry, but from the moment the new bride takes up residence in the abbey, she’s tormented by a mysterious black cat and experiences a series of nightmares that suggest the spirit of Ligeia is haunting her from beyond the grave. Hoping to end her suffering, Rowena’s former lover Christopher Gough (John Westbrook) launches an investigation, during which he intends to find out if the Lady Ligeia has truly returned, or if more sinister forces are responsible for these bizarre incidents. Unlike his previous Poe efforts, which were shot indoors on elaborate sets, Corman took his cameras outside for a fair portion of The Tomb of Ligeia, beginning with the opening scene: the burial of Ligeia. 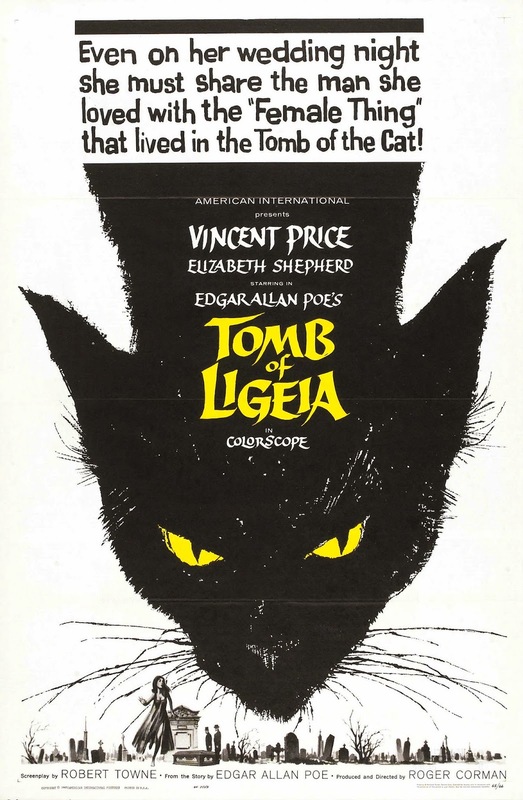 This sequence gets the movie off to a spooky start when the black cat mentioned above leaps onto Ligeia’s coffin, which has a small pane of glass at the top of it, through which we can see the deceased’s face. The moment the cat lands, Ligeia’s eyes immediately pop open. In a moment of excitement, Fell checks Ligeia for signs of life, only to discover his wife is still dead (her eyes opened as a result of an involuntary muscular contraction). Even though it was shot in the daytime, this scene managed to give me the creeps. In another change of pace, the setting for The Tomb of Ligeia isn’t a gothic mansion (like in The House of Usher) or a sumptuously decorated estate (like The Masque of the Red Death), but a dilapidated old abbey featuring dark, musty rooms and plenty of cobwebs in the corners. With exteriors shot at the ruins of the Castle Acre Priory in Norfolk, England, the film’s central location evokes a sense of decay that enhances the film’s theme of death and destruction. With a solemn performance by Vincent Price and a final 30 minutes sure to get the hairs on the back of your neck standing at attention, The Tomb of Ligeia finishes off Corman’s Poe cycle in terrifyingly stylish fashion.